Editor's note: Snivel filters alerted my good sense and had me revise my original version of this post, which went to press last night for a few short moments, but is here revised with, one hopes, a more digestible tone. "Really?," you might say. Well, I had the long-anticipated MRI of my right knee last week, and I have to say that the past seven days have generally been positive. The MRI showed no serious issue with my knee - like a meniscus tear or fracture. I've been able to run one of my go-to training routes, which also inspired me to write a reflection of its larger meaning (see post); and I've been running free of major pain, if only with mid-20 mile weeks. So, all-in-all, not too bad. Still, there have been some downsides to the past week, and they have some of the same qualities as the positive side. 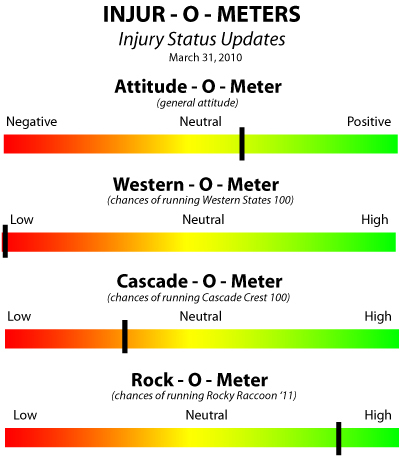 I'm still mired in 20 mile weeks with a knee that's on a hair trigger, and the MRI, while negative, also didn't show anything that was readily fixable, so from a prognosis standpoint, I'm pretty much where I was three months ago. This means the 2010 season is heading very very quickly toward a complete loss, which is pretty disappointing - to put it more lightly than I'm actually feeling it. Yet, it's not the end of the world. If it comes to it, it's just one season, and my MD has a plan. I'm supposed to slowly ramp up my miles until the knee starts hurting regularly again, which we both agreed wouldn't take too long, then inject some numbing agent and cortisone in the base of the knob on my knee to see if that helps isolate the problem and maybe even arrest things enough so they start to heal. Given the negative findings on everything else, it's a sensible approach. Of course, the midst of an issue is no place for context. So this is just a snapshot of my feelings at this particular time. It'll be interesting to look back and see what course things actually took from this point on. 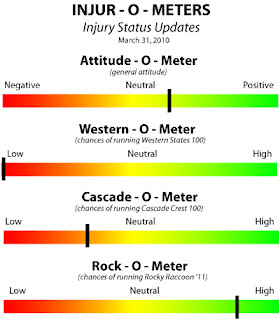 With negative findings and little progress the past three weeks, all measures in the Injur-O-Meters have taken a hit, most notably in attitude and prospects for CCC. Rock-O-Meter still high. Ever since the beginning of December I've been suffering with a similar knee injury. After Wasatch I unwisely kept my mileage up to prepare for HURT. Around the middle of December I had an MRI and the Radiologist believed they saw a small meniscus tear, along with tendinitis, and a cyst. I too could handle 20 to 30 mile weeks and I was getting fed up. Fast forward to 2 weeks ago when I go see a surgeon and he tells me he doesn't see the same tear in the MRI. He believes the pain is from a Plica (google it) and can be taken care of with heavy duty drugs (oral steroids) to knock down the inflammation. Well I took it really easy while taking the meds, only running a couple of times, and now that I'm done with the meds the pain is almost worse than before. The Dr. told me that he performs surgery on approx. 5 out 200 plicas he sees per year. I'm starting to think I might be one of those 5. BTW, my pain is medial (inside) and for the most part is a pretty dull ache, but can become sharp if I don't back off. I suppose I'm telling you all this because I feel your pain and frustration. I'm also starting to think 2010 might be a wash.
Good luck and I hope we're both healthy and toeing the line at Cascade. Christian, thanks very much for the comment. Part of the reason, I've chosen to right about my injury (ad nauseum some would say) is just for this type of information sharing. I'll be googling plica as soon as I get off Blogger. Thanks. And, yes, hope we're both at CCC.